The college currently possesses a two-storey Girls’ Hostel which can accommodate maximum 36 girls. Girls desirous of hostel accommodation may opt for the same in their application forms for admission. The hostel is placed under the supervision of a woman teacher as its warden. The borders are required to abide by a set of rules and regulations laid down by the college authority, and conform to a strict code of conduct both in and outside the college campus. Another Girls’ Hostel with financial grant to the tune of Rs. 50,000/- under Integrated Tribal Development Project (ITDP) of the govt. of Assam is proposed to be constructed soon. 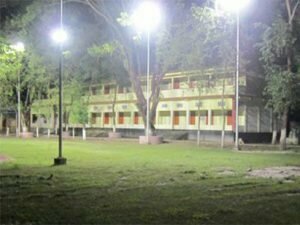 Majuli College has a spacious playground measuring an area of three acres of land on the bank of Doriadubi. Outdoor games are held on the playground during Annual College Sports Week. Some of the outdoor games are also held on the campus ground. The college has a well-equipped volleyball court with the latest ground-light. Moreover, various indoor game facilities such as TT, badminton, chess are also available in the college. Apart from Teachers’ Common Room, there are two Students’ Common Rooms: one for the boys and the other for the girls. The Common Rooms are well-furnished and well-equipped with facilities for playing table tennis, carom, chess, ludo and badminton. There is a beautiful and well-maintained garden in the college premises. Flowers such as salvia, petunia, pansy, gladiolus, marigold, dahlia, daisy, sunflower, lily, jasmine besides many other domestic breeds, are adorning the garden lending it a seasonal beauty all the year round. There are three separate cycle stands on the college campus: two for the students and the other for the teachers and employees. A strict vigil is maintained on these stands so that no incident of theft occurs. A spacious and hygienic canteen named Byanjana with indoor seating arrangement separately for teachers and students is available on the college campus. It provides a variety of eatables to the students, teachers and others. On special occasions, it facilitates arrangement of parties as well. Health hazards are taken care of. The college is located in the neighbourhood of a Community Health Centre. In the event of any emergency, government doctors are consulted immediately. Yet, we have a First-Aid Box at the disposal of a competent teacher, who attends upon sick students suffering from temporary and non-serious ailments. The college provides services on health issues like nutrition, abuses of drugs, remedies of depression, stress and eating disorders etc. The college also provides Ambulance facility to its students and the faculty.